Just a quick post today to say that I went over and climbed Mont Ventoux for the 2nd time this week. Below is the accepted fashion for doing big climbs in Europe – I stared a lot at that helmet on this climb (when I wasn’t doing so into the depths of my soul). And although I hadn’t planned on it, I clocked up a 1:31 ascent – not bad for someone getting back from a week of sitting and eating in the Alps. I’m still concerned about accumulated fatigue. One time up Ventoux is tough, but we’ll be entering another world with HR, I think. I do that sometimes … (nooooo, not the ride!) All I can say is don’t fall. Same as I tell myself. Anything you learn about accumulated fatigue I’d like to hear. Not that I’ll ever ride anything even similar to what you’re doing, but it is all relative. Thanks! Well, there is a little mountain i know of pretty near a certain town you’ll be visiting this September! nobody can say I don’t take care of my bike. LOL …Perfect, I never thought of it that way! are those full fingered gloves in 35+C ??? 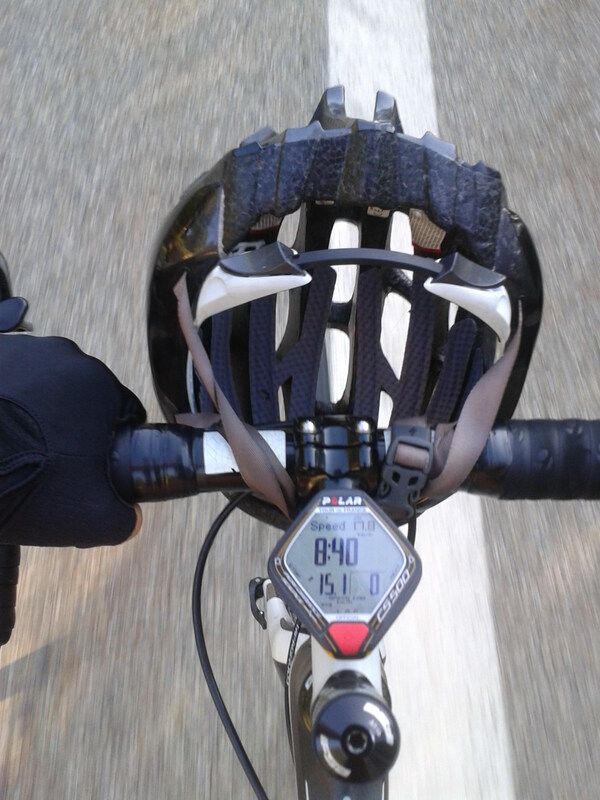 Yes, do ventoux 3 times in one day but a bit slower. Go from malaucene to bedoin and back, then see how much you can go up again :-). I almost did, but my riding partners had other plans. No, that’s an optical illusion there. It’ll be cooler, no question! Good luck on the climb. Put that thing back on your head, you organ donor, you! It was only on the way up, Rebecca. Promise! oh, so much safer. (can you hear the sarcasm?) At least your organs are in excellent shape, and many people could benefit….